Vijender Singh, a three-time Indian Olympian, 2008 Olympic bronze medalist, and current unbeaten super middleweight contender has signed a multi-year agreement with Top Rank, Hall of Fame promoter Bob Arum announced today. Singh (10-0, 7 KO's), who has fought all but one of his professional bouts in India and England, will make his debut under the Top Rank banner in early 2019. 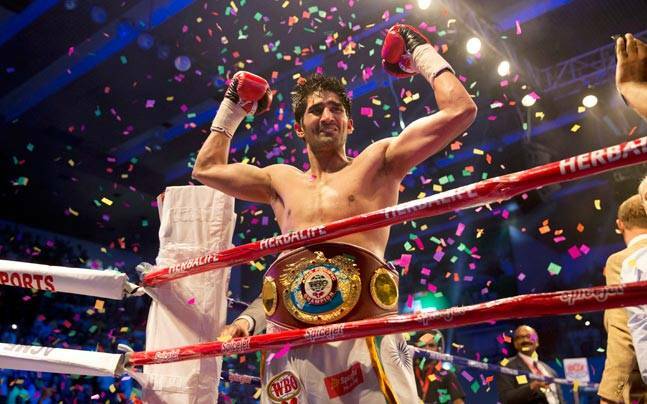 "Top Rank is very excited to enter into a contract with Vijender," Arum said. "We intend to make him a big star in the United States and look forward to him participating in major events in India, where he is already a major superstar." Singh, 33, turned pro in 2015 following an extensive amateur career that made him a mainstream celebrity in India, which included stints in Bollywood films and on the popular Indian dance reality show, “Nach Baliye.” But it was Singh’s in-the-ring accomplishments that set him apart. As an 18-year-old, he represented his homeland as a light welterweight at the 2004 Olympics in Athens. Four years later, at the Beijing Olympics and fighting as a middleweight, Singh captured a bronze medal to become India’s first Olympic boxing medalist. During the 2008 Olympics, he defeated Badou Jack, a current light heavyweight contender, and former two-weight world champion. Singh went on to capture bronze at the 2009 World Championships (where he defeated current top middleweight contender Sergiy Derevyanchenko), gold at the 2010 Asian Games, and qualified for the 2012 Olympics. As a professional, he’s captured WBO Asia Pacific and Oriental super middleweight honors. He last fought on Dec. 23, 2017, scoring a shutout 10-round decision against tough Ghanaian Ernest Amuzu at the Sawai Mansingh Indoor Stadium in Jaipur, India. Armed with Top Rank’s backing, Singh is hoping to become India’s first professional world champion. That journey begins in 2019.